Waves recently had a chance to catch up with the hardest-working mixer in show business, Lord of the Mix, Chris Lord-Alge. 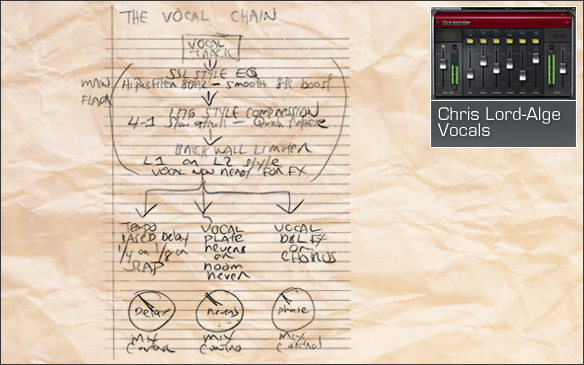 Chris also gave us some backstage perspective on the making of the Chris Lord-Alge Signature Series. Let's talk about each plugin, starting with CLA Guitars. The unique thing about CLA Guitars is that I made it for the guitar player that wants to sit late at night, plug in his direct box, and instantly have three choices of sound. Especially with so many people recording DI signals now, there's that instant gratification, to take a DI signal and automatically get a sound. 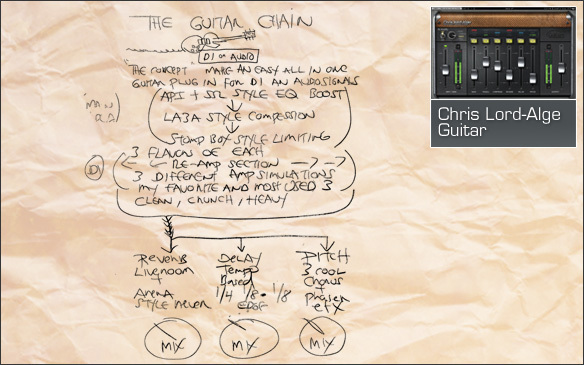 And the re-amping makes it completely unique, and the EQ I picked is really conducive to guitar. 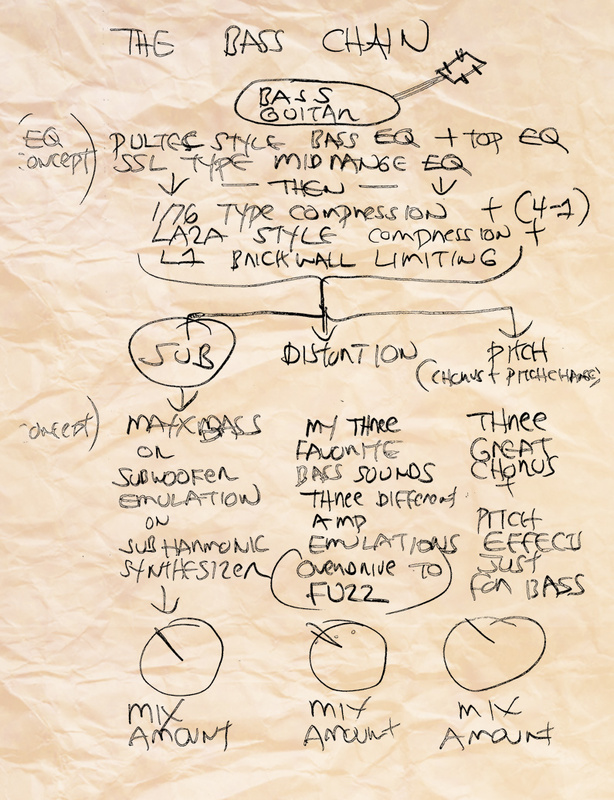 The EQ, compression, and the way the delays are setup, it's like, the perfect guitar setup. On a Wurlitzer or a Fender Rhodes, the biggest problem is that you can't get an authentic sound using a DI, you have to mic the amp. You can use the re-amp on the cleanest setting for a Rhodes or any of the keyboards that you just can't mic, so it really works for any of your DI needs. The hardest thing I always find with bass is getting a good distortion preset, to get a good distortion sound that's actually useable. So with CLA Bass, I put my three flavors of distortion there that work in every mix. I really took from all the mixes I've done and picked the right distortion that you can add to overdrive the bass. 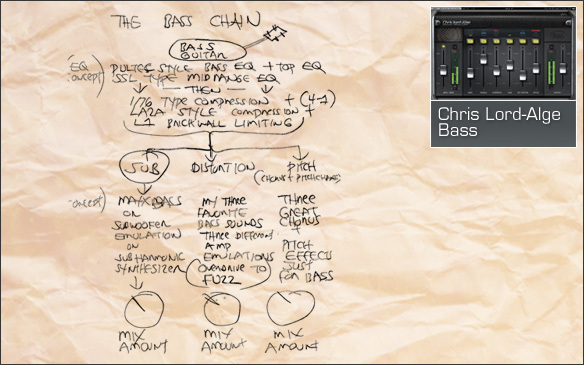 Plus, the frequencies I used to boost are just the ones you need: the upper, the mid, the bark, and the bite, so it's completely tailored just to bass. 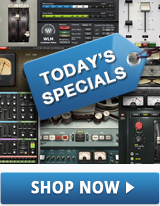 But like I said, with these plugins, you try them on anything, you're going to get great results. 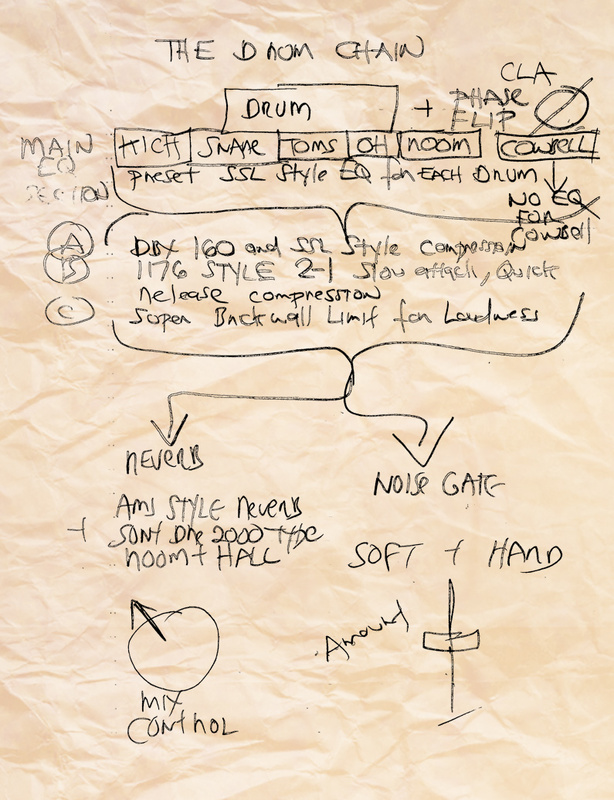 The most important thing to get right is the drums. 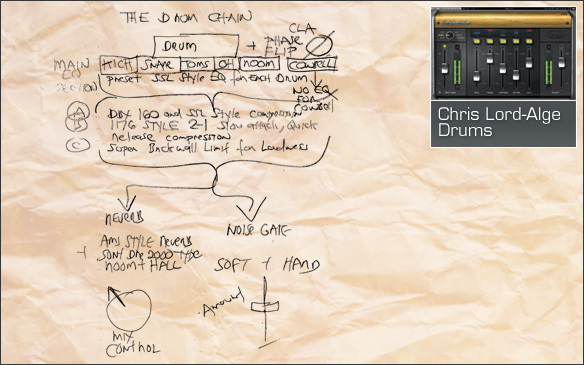 For CLA Drums, I looked at the kit, I looked at mixes I've done, I looked at all the EQs I would use for each drum, and gave you a toggle switch to pick the EQ curves for each of the six drum types. And just for laughs, I put cowbell on there, just so you have a percussion setting with some delay. So that's designed to just use the compressors and emulation of what I would use to get my drum sound. So it's really useful, a really hard thing to duplicate later with just piles of plugins. I was really happy with the drum one. Can it be used on sampled drums instead of a live kit? Absolutely, that would totally help out BFD or any sample drum library. It's just designed for the curve and the character of drums and the transient of drums. It's really built for that. You know that the song is the song when the vocals are right. I'm really fussy with my vocal chains, so on CLA Vocals, I took the three best compressor chains and the EQs that I would use to make the vocal thing happen, and just created the reverb space and the EQ curves that I would use. And that's the one I end up using the most, because you can go right to it and instantly it has everything you need. Everything I would use in a vocal, it has. 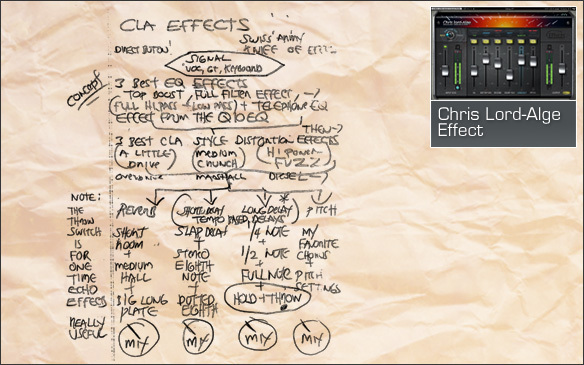 One of the things that makes the CLA Effects plugin special is the throw. The biggest hassle that you run into when you're mixing in Pro Tools is when you want to do an echo throw, you want to delay a word. 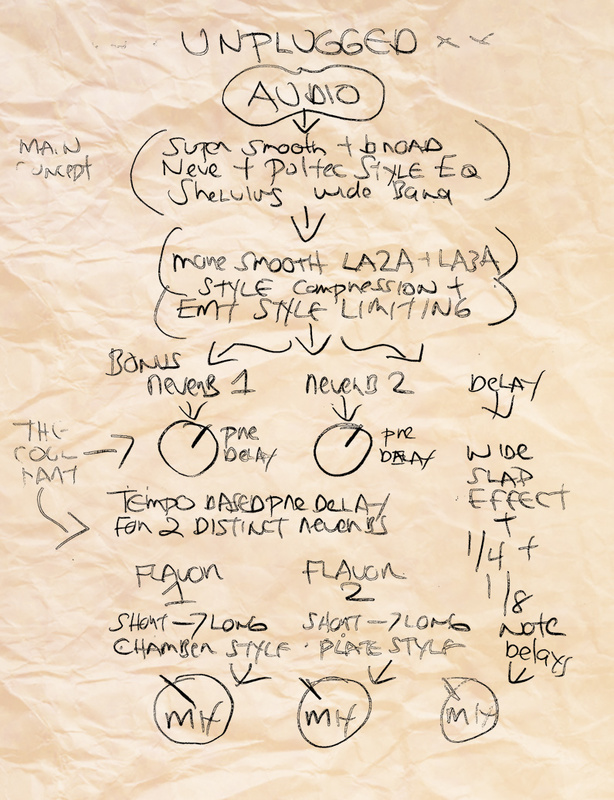 Let's keep it simple: All you have to do is duplicate your vocal track, put it on 100% wet, automate the throw button in all the spots you want, and you're done. And you can pick: All my delays are time stamped so, done. Your echo throw is done. And you can EQ it, you can actually put another plugin on it to EQ it or you can have the delay be filtered or reverbed or whatever. So it really shortcuts the stuff that we take for granted. Aside from the throw button, I put in some filtering and vocal distortion, some effects you can use for distortion, which are really great for delays or vocals. So the stuff that I use as effects on mixes which is, you know, distort something or filter it or built into the plate, that's all built into that. CLA Unplugged is like a Swiss-army knife. 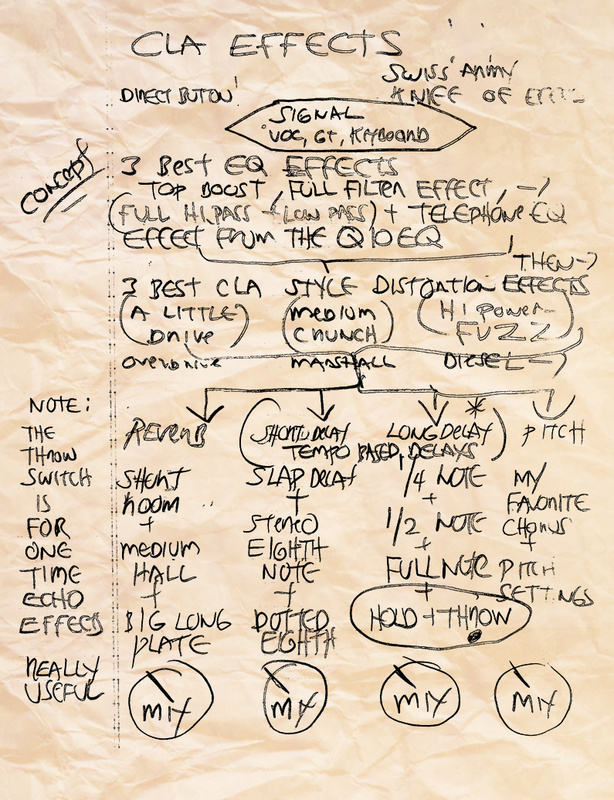 This is the one that you would use for piano, strings, for keyboards, for acoustic guitars, for stuff that you want big, broad strokes on. What this plugin has that you don't see in the others is two different reverbs with two sets of pre-delay controls. You know, one of the big sounds from the early '70s and '80s was that big pre-delayed plate. You can get massive, long pre-delayed reverbs and sonic soundscapes with Unplugged that would take so many chains to create the same atmosphere. It's really great on strings, to just have this nice delayed plate and this big broad EQ that's really thick, with wide shelves, and incredibly smooth compression. Would Unplugged work on sampled guitars, strings or even synthesizers? Absolutely. 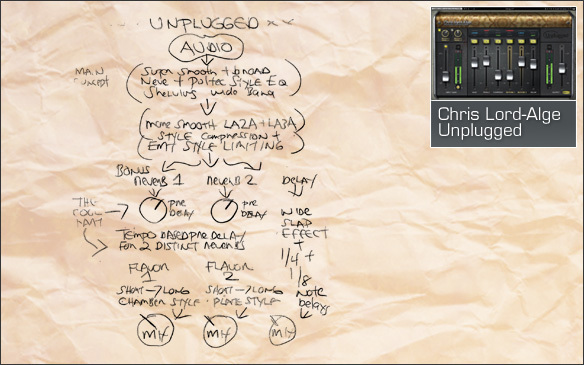 CLA Unplugged is there to help beef up all your DI stuff, all your direct keyboards, all your direct synths. Because by having the reverb and the compression and the EQ, it'll help amp it up a bit. Tell us a bit about the development process. Since we'd already worked on a couple of projects which were basically emulating equipment, and it was time to start from scratch, they kind of gave me free rein to create something that would be exactly what I would want to have and use. It was really over a good dinner with [Waves product manager] Mike Fradis, over some good steak and some good wine, where the cocktail napkins came out and the pens started to fly, and then all of a sudden there was a flow, a workflow, a block diagram that started to create the CLA Artist Signature plugins. Was there a lot of tweaking, a lot of back and forth going on? It definitely took a lot of tweaking, because I wanted it to be simple; I wanted to insert the plug and have it automatically improve what it got. And when you switch between modes, I wanted it to be completely seamless. So, in my brain, I kind of had the finish line, I could see it, but sonically I wanted to hear certain flavors. Waves really came to the plate and solved these problems that I didn't think about, because I was thinking about it as a user, not as a developer. It took almost a solid year for us to complete it, from start to finish. What was your goal with the Collection? I wanted to solve a problem. I thought there was a real problem for the musician, for the first time engineer, for the guy that just wants to go. Basically, it's like a miniature console on each channel, a plugin that does everything you want, in one plugin. They give you just enough of everything, so you're not trying to set up auxes and returns. These plugins are completely designed based on my work technique and the simplicity in organization. I like to focus on the music and not the route getting there, just focus on the thing that makes the song happen. 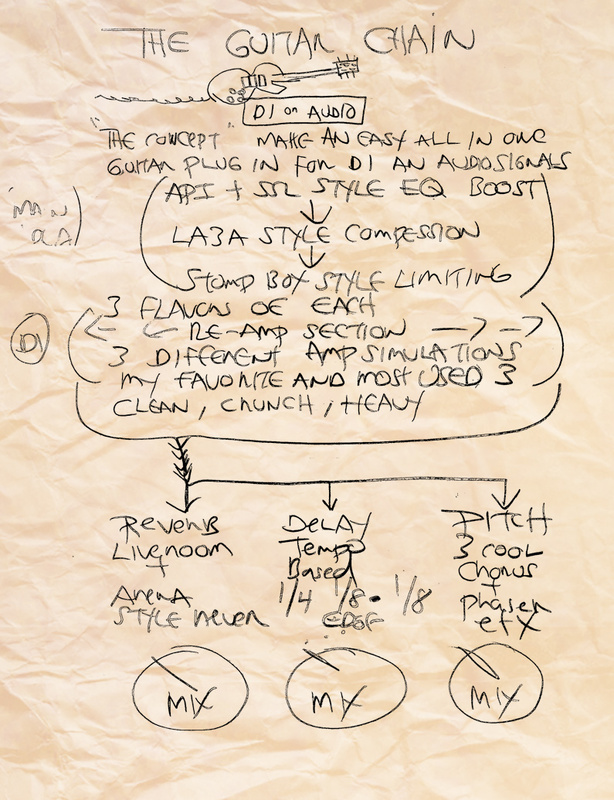 I would say my workflow is built right into the design for the Artist Signature plugins. Could someone get the same results using individual plugins? I don't really think you could do it. You could not copy that plugin; you wouldn't have enough horsepower to put it on six channels. It would really complicate your session too much to do that and it would be just too confusing. I think the way they're built really makes it real easy for the user at this point. Right now, we're working on a combination of projects. We are working on My Chemical Romance's new album and Sugarland's new album, which I'm just about done with. And between that, I'm finishing the new Santana album for Carlos and a new Bon Jovi record. Well, basically half a new Bon Jovi record for a greatest hits album, so kind of a combination of punk rock, country, classic rock, and then '80s rock. And even an English band called Manic Street Preachers, I'm halfway through their record. We kind of go between all of them, all at the same time. How would you describe your overall approach to mixing? I tend to attack this like a musician. I have an incredible thirst and an incredible hunger for music, and I like to conquer every song. So for me, it's almost like a feeding frenzy. I just do it because I like to do it, I could do it because I love to do it. I never think about, you know, stopping. But I think about when people ask me, "Hey can you do this?" or "Hey can you do that?" or "this song", or "this song", I'm like, "Yeah just bring it all here," because I definitely like the combination of different styles of music. What do you do when you get sent a mix with too many tracks, too much going on? I think that at some point you have to raise your voice and use your experience to help them solve a problem. The biggest problem in the music business is no one can make a decision and no one will stand up to an artist. They're all afraid to say something. I like to stand by my ideas. I would much prefer to say, "Look I really think this song feels better with all these parts muted, and make it build, and give the song more space." And you know what? I will sell my point all the way until they agree and then they say, "You know what? Just make me a version with a few of those parts back and I'll compare it later." 9 times out of 10, I win, because my conviction helps sell it. Every record I work on, if there's something in the way, I will get it out of there. Because they don't want you to lie to them, they want you to do that. 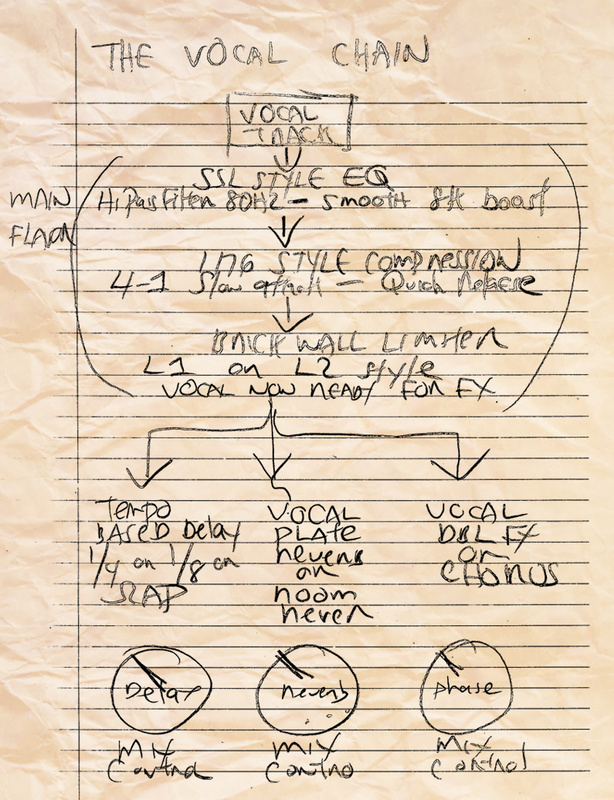 Bottom line, the most important thing is to make the song work.